Waikinya Clanton, the associate director of community engagement for the Democratic National Committee, talked about the importance of black voters to the Democratic Party at an event in the Marvin Center Amphitheater Monday night. A top member of the Democratic National Committee came to the Marvin Center Amphitheater Monday night for an event about the role of the black vote in the Democratic Party. 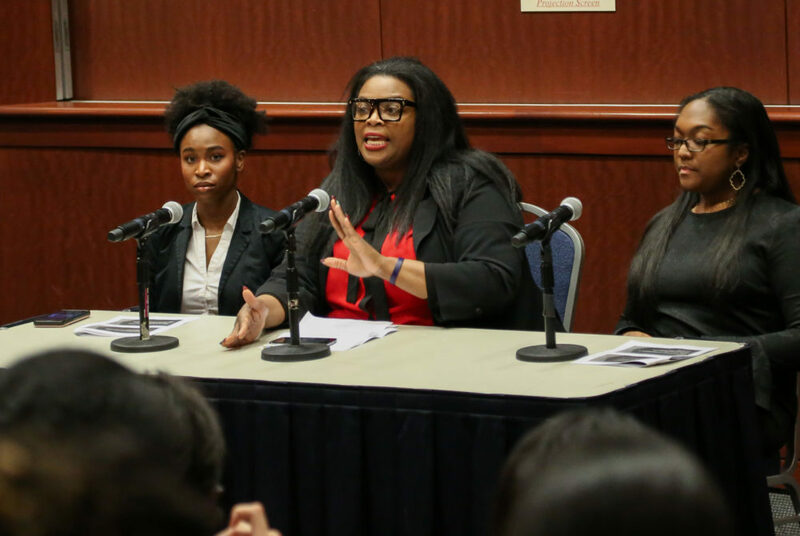 The discussion, organized by the GW College Democrats, the Alpha Kappa Alpha Sorority, the GWU Black Men’s Initiative and the Black Girl Mentorship Program, featured Waikinya Clanton, the DNC’s associate director of community engagement, who talked about need to make black voters feel valued as a core part of the party’s base. Clanton said it should be the role of the entire party to promote and highlight issues important to the black community. Clanton recounted a history of efforts to disenfranchise black voters, including voter suppression through closed polls and broken down election machines. She said U.S. elections have continued to struggle to incorporate all voices of the electorate, an issue she called both “disgusting” and extremely challenging to fix. “We understand that voting isn’t just a right, but a responsibility,” she said. Clanton added that 2016 was the first time some black voters in the deep south felt that they could go to the polls without needing protection, highlighting cases in Georgia and Montgomery County, Ala. She also emphasized that the DNC is working to expand voter protection hotlines, providing training on dealing with voter harassment and – if necessary – providing lawyers in areas where voter suppression remains a threat. Clanton also discussed the need to “stay attentive” and hold elected officials accountable for campaign promises. She pointed to gerrymandering as an example of representatives attempting to control their time in office by shaping districts that will be friendly to their policies. “You should never let a person ask you to vote for them without asking them what they are going to do about X, Y and Z,” she said. Clanton gave audience members the opportunity to register to vote during the event if they hadn’t already signed up. She added that the most important goal for the party should be bringing people from all walks of life to the table and including them in a discussion about the issues facing the country. “We are an ocean, not a tent,” she said.